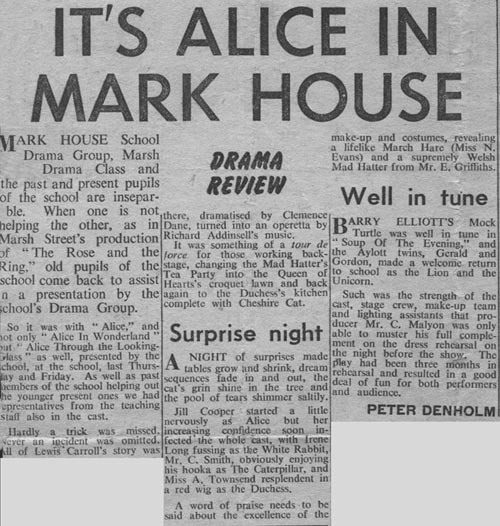 Both of the newspaper clippings shown in the memorabilia from this joint School and Drama Club production of ‘Alice in Wonderland’, were originally featured in the ‘walthamstowhistory.com’ website run by Dickie Dunn – who, as shown by the names in his ‘Lighting Plot’ copy of the script, was clearly in his usual backstage role with the ‘ancient’ lighting board – ably assisted, as also noted, by Cleve Edmundson! Walthamstow Guardian Newspaper Clip – 24 June 1964. Originally shown in the ‘walthamstowhistory.com’ website. See typed text below. The ‘Trial Scene’ from ‘Alice’, with Maxine being the ‘key witness’ in her role as The Cook! Just how enthusiastic they are about their favourite class a large number of the scholars, backed by their teachers, demonstrated to enthusiastic audiences in the school hall – affectionately known as The Mark House Theatre – on Thursday and Friday. Since Easter the dramatic club has been preparing for and rehearsing ‘Alice in Wonderland’ and ‘Through the Looking Glass’. The productions were a tribute to their enthusiasm and ingenuity. Seventy costumes were made by the Needlecraft Mistress Miss Marjorie Kett and a number of girl scholars. Two of her chief aides were British Guianian twins of Chinese descent – Jennifer and Jacqueline Gillete. 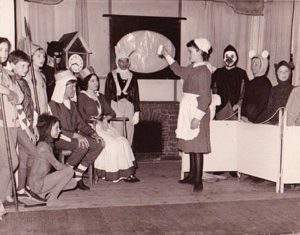 Such is the sustained interest of Mark House scholars that many of the characters in the play were ex scholars who have graduated to the Marsh Street Youth Centre Drama Club which also meets in the Mark House School. Lending a little dignity and maturity to the entertaining production were five teachers – Mr C Smith, Miss A Townsend, Miss N Evans, Mr E Griffiths and Mr M Bone. All the effective scenery panels were designed and painted under the supervision of school Art master Mr J Jones. Rarely off the stage for two and a half hours was 12 year old Jill Cooper, an amateur ballet dancer, a superb ‘Alice’. Word perfect she moved gracefully from scene to scene, establishing the essential continuity in Lewis Carroll’s two classic works. Alec Malyon, Edwin Coleman, Peter Wright, Derek Knight, Michael Casey, Keith Franklin, Robert Jackson, Keith Brownutt & Robert Gouldstone.